Games, Books and Apps for that! When installed – it sits in the System Tray on startup – so it’s always to hand one click away! I wrote ToDo simply to keep my own mental stability as I dragged Gemstars out of the cupboard and kicked it into shape for release. It proved to be an invaluable tool – I used it to track design and and feature implementation, bugs and issues. I couldn’t find a ‘Todo’ tool that was a) simple and b) hierarchical – so I wrote one instead. I would no doubt have gone insane without it! Download the full unlimited version of ToDo here – it is ENTIRELY FREE! 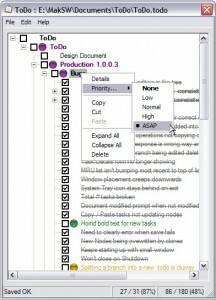 Quickly create a hierarchy of ToDo’s in the familiar “explorer” style tree view. 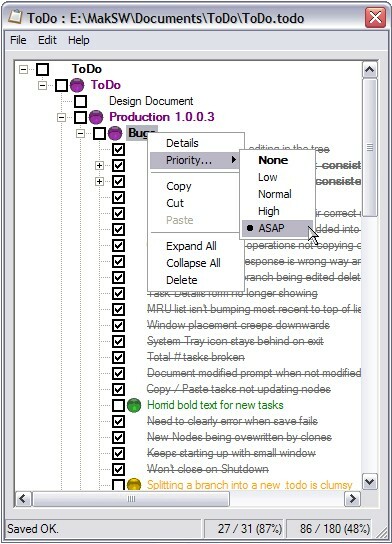 Assign priorities to your tasks, and see at a glance their open/closed status. Cut/Copy/Paste or Drag n’ Drop tasks in your document as you see fit. Autosave feature backs up your open .todo for safe keeping. Access ToDo from the system tray, so it’s always there to lend a hand. Print your .todo’s so you can show others how busy you are! Dedicated to a professional approach to software engineering, we believe we can build and deliver quality products and enjoy the experience at the same time!